I believe that many readers of this blog are amateur astronomers. I also believe, based on my own subjective experience, that a very small number of amateur astronomers are active on Twitter. When I ask friends and colleagues why they aren’t active on Twitter, I usually receive mumbled replies mentioning Justin Bieber or just the simple statement “I don’t do those things” (I guess in reference to Twitter and Facebook or maybe they’re also referring to Justin Bieber). In any case, if you are interested in astronomy and space exploration and you’re not on Twitter then you are really missing out. @NASA – NASA has multiple Twitter accounts that correspond to specific missions and organizations. I guess you could call this account an umbrella account because it has information about many NASA missions as well as general space information (e.g., asteroid 2012 DA14 passing close to Earth on February 15, 2013). @KarenLMasters – Karen is an “astronomy researcher at University of Portmouth (involved especially in Galaxy Zoo project and LOFAR-UK)”. @Caltech – this is the Twitter account for the California Institute of Technology. @CatherineQ – Catherine describes herself as an “astrophysicist, science communicator, over-thinker”. She’s also a university professor. @seanmcarroll – Sean is a theoretical physicist at the Moore Center for Theoretical Cosmology and Physics at Caltech. He’s also the author of “The Particle at the End of the Universe”. @astrobetter – A blog and a wiki for professional astronomers (I’m not a professional astronomer but I read it anyway – let’s keep it our little secret). @closefrank – This is the Twitter account for Frank Close “scientist, author and broadcaster. Currently writing a book about Bruno Pontecorvo – the physicist who inspired the standard model but was he also a spy?”. @cosmicpinot – This is the Twitter account for Brian Schmidt who describes himself as “An overly busy Cosmologist, Grape Grower, Astronomer, Wine maker, Dad and Husband.” He is also a Nobel Prize winner (2011 Physics). @MarsCuriosity – This is NASA’s Twitter account for the Mars Curiosity rover. @davidwhogg – David Hogg is an “Associate Professor with tenure, Department of Physics” at NYU. His main interests are in observational cosmology. @astrobites – Astrobites is a blog written by astronomy grad students. @astrobites is their Twitter account. @ESO – The European Southern Observatory. @sarahkendrew – Sarah is a “Postdoc Astronomer-slash-Engineer, Max Planck Institute for Astronomy, Heidelberg”. She also has a very good blog at http://sarahaskew.net. @AAVSO – American Association of Variable Star Observers. The “world leader in variable star research”. As you can see, this is a pretty varied group of individuals and organizations. However, this list just scratches the surface. As I said earlier, I follow 202 accounts on Twitter. If you’re interested in astronomy you owe it to yourself to join Twitter and start learning. Today. Yesterday I had an amazing experience – I attended a tweetup at the Jet Propulsion Laboratory (JPL) in Pasadena, California. (A tweetup is a meeting of Twitter users.) The tweetup was organized by JPL and limited to a certain number of participants (in this case about 110 people) who were fortunate enough to be chosen randomly to participate in this event. When I was selected I knew I was lucky but I didn't really know how lucky – the tweetup was just fantastic! Why? Primarily because of the people. Everyone involved – organizers, speakers, engineers, scientists, project managers, graphic designers, visualization producers, rover drivers, graphics programmers, social networking communicators, you name it – had an incredible passion and enthusiasm for their job and for the space program in general. We as a society may take the accomplishments of these people for granted from time-to-time but we shouldn't. They accomplish amazing things and we should all be very proud. I spent most of last week in Big Bear Lake, California at the Society of Astronomical Sciences 30th Annual Symposium on Telescope Science. I had a great time and I learned a lot. Despite it's name, the symposium had relatively little to do with "telescope science" per se and a lot to do with astronomical science. Amateur astronomers frequently spend the majority of their time focused on one of three activities: visual observing, imaging or science. The scientists often specialize in photometry or spectroscopy. 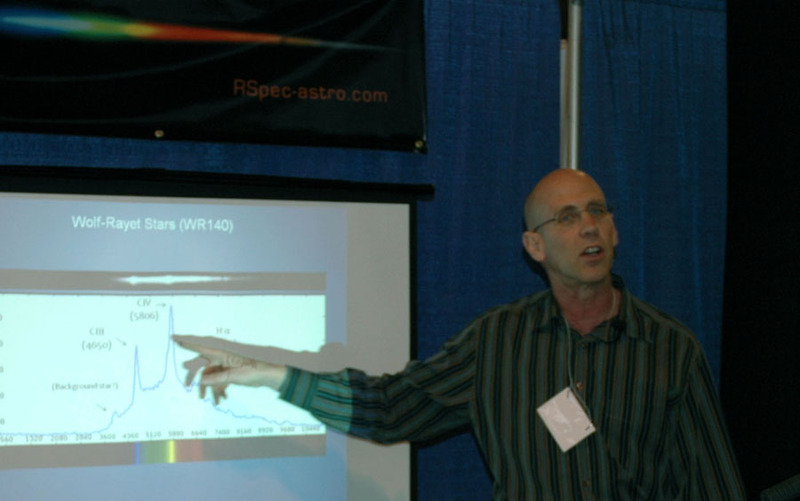 At NEAF 2011, I finally got to meet two very influential and important people in the world of amateur spectroscopy: Olivier Thizy of Shelyak Instruments and Tom Field (shown in the image to the left) the creator and developer of the RSpec program. I had interviewed Olivier in August, 2010 but I hadn't interviewed Tom yet. When I got back to San Diego I wrote Tom and asked him if he would be willing to do an interview and I'm happy to say that he graciously agreed. Included below is our email interview. What functionality is provided by RSpec? RSpec is a program that allows a beginner or expert to capture and process spectrums of stars and planets. The program makes it easy to convert the rainbow-like smudge of a spectrum to a calibrated, annotated graph. These graphs reveal the composition and other physical properties of the star or planet you're observing. It's really quite exciting to be able to do this easily. Was the Merry Monarch's birth heralded by a supernova? Alan Traino is an amazing guy. In case you haven't heard his name before, Alan is the Chairperson of NEAF. Every year he outdoes himself and this year was no exception. NEAF 2011 had about 140 vendors, probably around 15 speakers and almost 6,000 attendees. 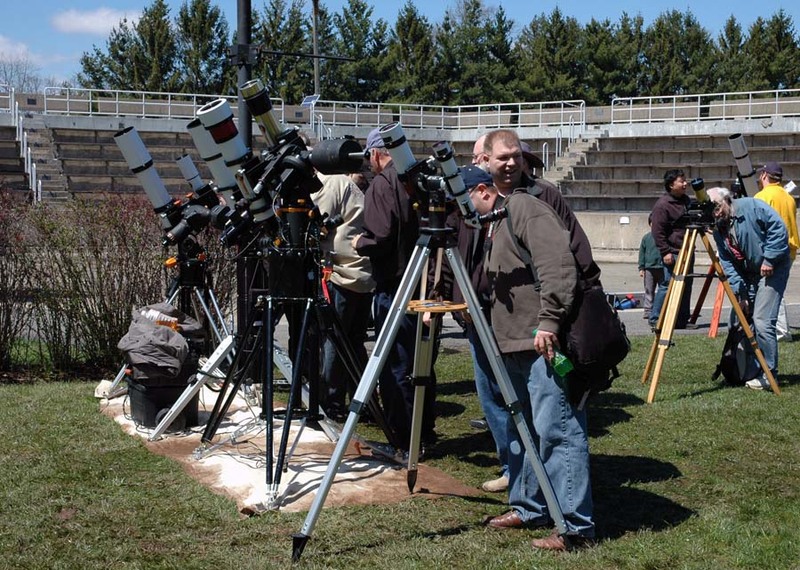 NEAF is the largest astronomy expo in the world. Organizing an event of this size can't be easy but Alan makes it look easy. We all owe a big thanks to Alan for a job exceptionally well done. While the Solar Star Party was in full swing outside, the exhibit hall was filled with activity inside. As I mentioned in yesterday's blog posts there are a lot of different types of vendors at NEAF. The following image is good example. This is an 11.5 foot ExploraDome II with an optional bay extension.